One of the powerful features of your Cisco collaboration solution is the embedded set of Cisco call forwarding features. It allows users to receive their calls not only on their desktop phone or Jabber client, but also on other devices or at other locations. But what Cisco call forwarding features can you choose from? How do you use them? And is it possible to make the use of this functionality more intuitive? This is the most commonly used Cisco Call Forwarding feature. You simply – however, it’s not thát simple as we will illustrate below – activate it and calls are automatically redirected to another number. There are no conditions associated to the call forward action, so this type of forwarding is sometimes also referred to as call forwarding unconditional. Call Forward Busy (CFB). Call forwarding on busy can be activated to have calls answered even if the called party is busy. In that case the call can be forwarded to voice mail but also to another extension number, for example a colleague. Call Forward No Answer (CFNA) is also known as Call Forwarding No Reply. Using this feature, calls are forwarded when they are not answered within a pre-configured No Answer Ring Duration interval. Also, if the destination number appears to be unregistered, the Call Forward No Answer functionality is triggered. Call Forward with Alternate Destination is a feature that handles the situation when a call to a directory number and the forwarded destination are not answered. In that case the call is forwarded to a last resort destination number. This type of call forwarding is also referred to as MLPP Alternate Party destination. Call Forward No Bandwidth forwards calls when the actual destination cannot be reached due to insufficient bandwidth. The call can be routed to an Automated Alternate Routing (AAR) destination over the public switched telephone network (PSTN). Call Forward No Coverage (CFNC) forwards calls when the hunt list is exhausted or timed out and the associated hunt-pilot for coverage specifies “Use Personal Preferences” for its final forwarding. Call Forward Unregistered (CFU) is used to reroute calls when a phone is unregistered due to a remote WAN link failure. In that case the system can reroute the call through the PSTN. The Cisco call forwarding is manually invoked via the keypad of the desktop telephone. This sometimes makes it not as intuitive as one would hope. 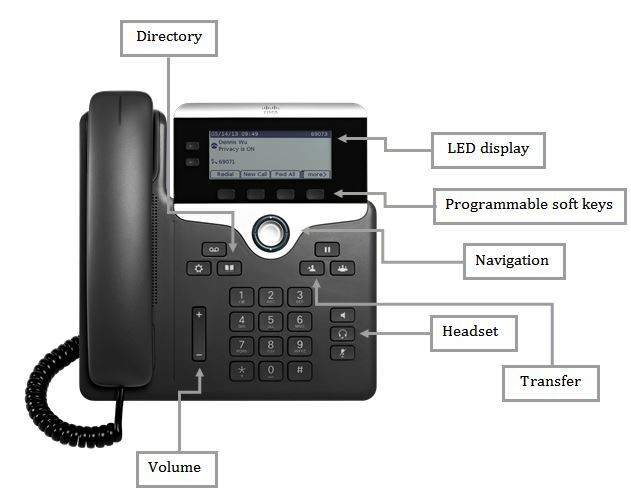 For example, if you want to forward all calls for a Cisco IP Phone 7800 Series, you first select the line. Then you press the soft key ‘Fwd all’ – if configured such that it is on the main screen – and subsequently dial the number that you want to forward to. Not entirely intuitive. Besides being non-intuitive, the task is also not automated. It is not possible to configure call forwarding unconditional such that it is automatically activated when you leave your desk. There is of course the Call Forwarding No Answer feature. But this feature only redirects calls after the No Answer Ring Duration interval has passed. How often the caller will simply hang up long before this forwarding functionality is triggered? When the computer or laptop is active, the application recognizes this active state. Incoming calls are then routed to their default destination in the Cisco network, i.e. 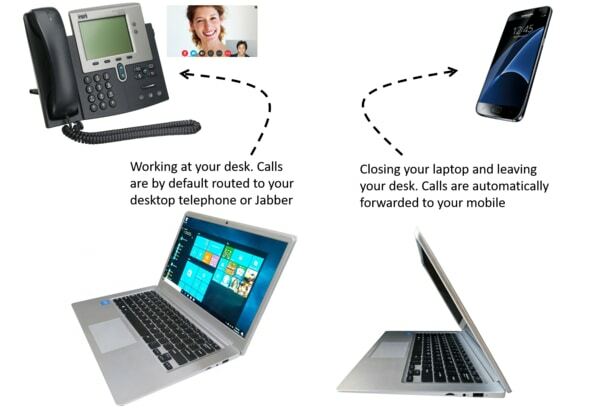 a desktop phone or Jabber client. When the user switches off the computer (or it goes into standby mode), calls are redirected to his or her mobile, voicemail or another destination number. The user can configure this once and it will always work like this. So, from now on you can use Call Forward All without the need to activate it every time when you leave your desk (and deactivate it when you come back). The solution simply monitors the state of your computer. When it is switched off, standby or dormant, calls are forwarded. Start working on your computer again, and your calls are routed to the desktop phone or Jabber client.